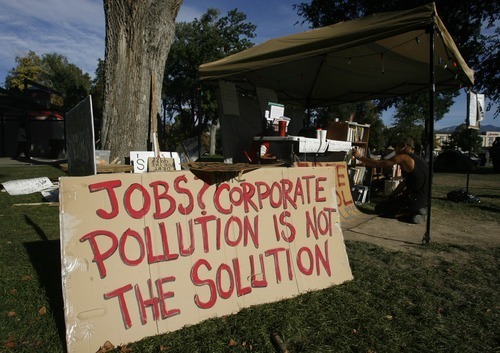 Rick Egan | The Salt Lake Tribune Occupy Salt Lake, in Pioneer Park, Friday, October 21, 2011. Occupy SLC on Saturday said it would begin more frequent protests outside the Federal Reserve building and hold town hall meetings for the public. A news release referred to the Federal Reserve protests as the "first additional front" for Occupy SLC, which has established a camp in Salt Lake City's Pioneer Park. The release said demonstrators would remain outside the Federal Reserve building, 120 S. State St., overnight and have daily assemblies there. It added demonstrators would comply with city ordinances prohibiting blankets or sleeping bags on the sidewalks. Since its start on Oct. 6, Occupy SLC has held small daily protests outside the bank, which is officially the Salt Lake City branch of the Federal Reserve Bank of San Francisco. The group also announced "The 99% Town Hall by Occupy SLC" to be held from 7 to 9 p.m. Monday through Thursday at the amphitheater of the main branch of the Salt Lake City Library. The release said the event is to discuss the larger issues of the movement with people who cannot regularly attend assemblies at Pioneer Park.